The latest EUROCAE (European Organization for Civil Aviation Equipment) ED-137 inter-operability standards, address migration and implementation of IP technology for voice services for air traffic control. 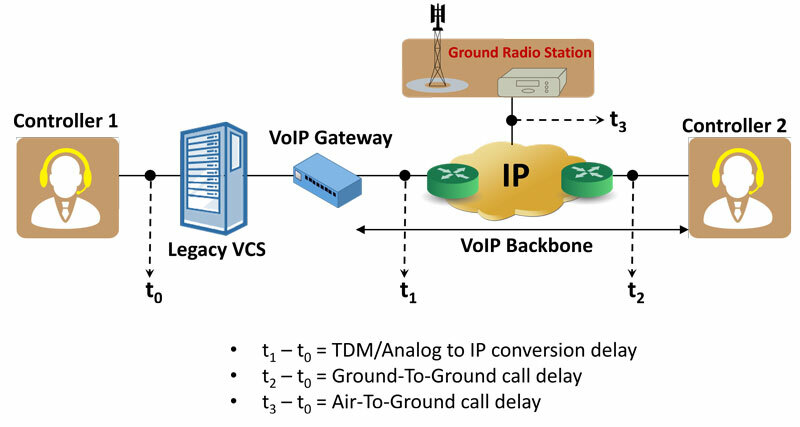 The familiar industry standard SIP protocol is specified to establish, modify, and terminate voice sessions with endpoint equipment within an Air Traffic Services Ground Voice Network (AGVN). As shown above, the endpoint equipment can be a SIP based Controller Working Position (CWPs), Next Generation Voice Communication Systems (VCS) and Radios, or VCS/Radio Gateways allowing interworking with older legacy equipment and protocols. The legacy TDM VCS system will initially connect to an IP WAN network backbone using VoIP gateways. Though migrating to an IP network provides convergence advantages for traffic and interoperable network elements from various vendors, it also poses challenges – of variability of different implementations by equipment vendors. Some of these are: implementation of technologies with varied jitter buffer, packetization, digital signal processing algorithms, VOX operations, and switching from idle to active state. These implementation differences impact end-to-end delay requirements imposed by various industry standard bodies. Characterizing and limiting these impairments is critical to the performance of the system as a whole. Rigorous methods are needed to precisely measure the delay introduced by each network element as events propagate end-to-end. Recognizing, capturing, timestamping, and correlating events at analog, TDM and IP interfaces are necessary. Delay measurements should be conducted repeatedly to ensure that the device and network under test is performing as expected consistently over time. GL has developed MAPS™ TM-ATM (Timing Measurements in Air Traffic Management) test suite to accurately simulate end points in ATM network and provide critical timing measurements for various types of delay occurrences in signalling and voice transmission through the network. It includes all necessary hardware and software to identify, capture, timestamp, and correlate events at Analog, TDM and IP interfaces. The above TM-ATM solution includes various GL test tools such as Audio Analyzer (which uses GL's VQuad™) and Packet Analyzer, TTL Signal Packetizer, Discrete Signal Logger, Event Data Logger (all these components use GL’s PacketExpert™- platform). All these components are controlled by a centralised component called MAPS™ Administrator (TM-ATM Client). All the components support a client server model, with the MAPS™ Admin acting as a client and controlling all the other components which act as servers, from a centralised location. Some of the standards bodies like the Federal Aviation Administration (FAA) in the USA has published specification for NVS system defining timing requirements in detail. The below TABLE extracted (from the FAA-E-NVS1_NVS-Specification_v1_1_2012-01-10 document: refer Table 3-9) depicts Setup/Teardown Throughput Timing Requirements during Peak Busy Hour (PBH) and Peak Busy Minute (PBM). To perform these timing measurements, one can setup MAPS™ TM-ATM (Timing Measurements in Air Traffic Management) tools at appropriate strategic interfaces. GL’s MAPS™ TM-ATM is a custom suite of test tools, designed to accurately measure various types of delay occurrence in signalling and voice transmission. It includes all necessary hardware and software to identify, capture, timestamp, and correlate events at Analog, TDM and IP interfaces. 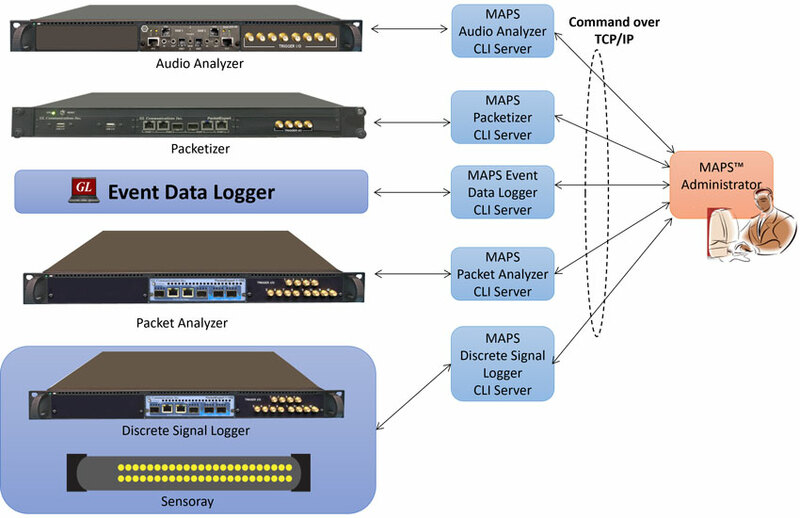 The Packet Analyzer, Packetizer, Discrete Signal Logger, and Event Data Logger products are all 1U rack platforms based on the same GL’s PacketExpert™ Ethernet/IP hardware; their functionalities differ through scripts that cater to different needs of test cycle. GL offers two flavours of PacketExpert™ Ethernet/IP hardware: PacketExpert™ SA (PXE104) and PacketExpert™ 10GX (PXN100), both hardware platforms support four 1G ports on the unit. These tools are equipped with optional TTL I/O ports to trigger events of interest occurrence during tests. 4-Port PacketExpert™ w/ Embedded Single Board Computer (SBC). SBC Specs: Intel Atom CPU, 4GB RAM, Windows 7, MSATA SSD, 2 USB Ports. GL's Audio Analyzer is a 1U rack platform that uses VQuad™ Dual UTA as the base hardware combined with SBC for PC interfaces. The Dual UTA includes PTT/Audio interface, required for radio interface simulation. With VQuad™, it is capable of automatically keying PTT from the CWP, then transmit and receive audio signals, and generate TTL triggers based on PTT activation. Dual UTA w/ Embedded Single Board Computer (SBC). Packet Analyzer, Packetizer, Discrete Signal Logger, and Event Data Logger– all these are based on the same GL’s PacketExpert™ Ethernet/IP hardware; their functionalities differ through scripts that cater to different needs of test cycle. Audio Analyzer – this is based on VQuad™ Dual UTA hardware; its main functionality is to simulate radio calls from CWP. All components of MAPS™ TM-ATM are controlled by a centralized component called MAPS Administrator (TM-ATM Client). MAPS™ TM-ATM support a client server model, with components acting as servers, the MAPS Admin acts as a client and controls all components acting as servers, from a centralised location. The time from which an Air Traffic Controller depresses the PTT until the IP stream indicates that the PTT bit is set is an important testing example. This delay measurement is possible using GL’s Audio Analyzer and GL’s Packet Analyzer. Both are capable of generating TTL triggers based on PTT activation. The Packet Analyzer is capable of generating Packet and TTL triggers based on real time packet detection, filtering, and capture as necessary. Below a remotely located MAPS™ Administrator instructs GL’s Audio Analyzer connected to a CWP to activate PTT and simultaneously generate a TTL trigger. The Discrete Signal Logger connected to the Audio Analyzer can detect the TTL trigger and post an event to the Event Data Logger. On the IP side, GL’s Packet Analyzer which is monitoring the line non-intrusively can detect the packets of interest (e.g. first RTP packet with PTT bit set) based on the filters set and post an event to Event Data Logger. Centrally located the Event Data Logger time tags these received events and reports these events to the MAPS™ Administrator. The MAPS™ Administrator will calculate the time difference between different events posted and reports the measured delay. Audio Analyzer – The Audio Analyzer is a 4-wire audio device that can connect to a CWP and emulate a controller by activating PTT and transmitting audio. It supports PTT interfaces to connect to CWP Dual Jack Module and other 4-wire interfaces. It can send a PTT signal through 4-Wire interface exactly as though a real user is holding PTT on his/her headset. It can also inject and record analog signals at CWP, Radio and VoIP gateway interfaces. The analyzer can generate TTL for different actions (PTT ON, PTT OFF, Send Audio, Detect Audio). The Audio Analyzer can also be utilized in other areas of the network where analog audio signals are present. Packetizer – works in tandem with the Audio Analyzer to convert analog events into packet events. The Packetizer monitors the TTL output from the Audio Analyzer on a regular interval, and for every trigger pulse received, it generates and transmits a timestamped IP packet indicating which pulse it received, to the EDL. The packets generated by the Packetizer are named as Discrete Events. This indicates a certain event has occurred. The Packetizer samples the TTL inputs on a regular interval, for every trigger pulse received, it generates and transmits a timestamped packet indicating which pulse it received. Packet Analyzer - It functions like a highly precise Ethernet tap. It acts as a transparent Ethernet link in which bidirectional Ethernet traffic flows through at line rate. Additionally, Packet Analyzer can filter certain packets of interest from both directions without disturbing the traffic. The filtered packet's first 12 bytes of the MAC header is modified (overwritten) with useful information such as the filter number, port number, and device ID. These modified packets generated by the Packet Analyzer are named as Timed Events and are forwarded to the Event Data Logger. The Packet Analyzer can aggregate filtered and modified packets from both directions and forward over a single output port. Packet Analyzer also supports generating output TTL signal pulses for every filter match, so that the TTL signal (representing the Filter match) can be taken out and processed using an external device like Oscilloscope. Event Data Logger– The Event Data Logger is located at a central location and receives the event packets forwarded from the various Packetizers and the Packet Analyzer systems throughout the network. It timestamps each received packet, decodes the packet to extract information, and updates both Discrete Events (from the Packetizer) and Timed Events (from Packet Analyzer) to the MAPS™ MTC (Master Test Controller). It utilizes an onboard 2 GB DDR2 memory to temporarily store the received packets before being transferred to the MAPS™ Controller for analysis. MAPS™ Administrator (TM-ATM Client) - The MAPS™ Administrator is a control/logging application, and it uses TCP/IP to send commands to and receive notifications from all the above-mentioned tools (PacketAnalyzer, AudioAnalyzer, TTL Signal Packetizer, EventDataLogger). MAPS™ Administrator will calculate the time difference between posted events, i.e., Discrete Events (from the Packetizer) and Timed Events (from Packet Analyzer) and reports precise measured delay at different points in the network. MAPS™ TM-ATM is script based and API driven products that can be reused for various purposes during test cycles. When Audio Analyzer performs a certain function, it simultaneously sends a discrete TTL pulse to the Packetizer. When the Packetizer receives this pulse, it creates and transmits a timestamped packet indicating which pulse it received. This allows us to get analog and digital events into the same log for delay measurement. Further this packet is filtered out by the Packet Analyzer and forwarded. Up to 16 filters can be operated simultaneously per port. For every packet that successfully passes a filter, the Packet Analyzer can generate TTL Triggers to indicate this event. The analog signals timing relationship of both Audio Analyzer and Packet Analyzer can be verified by connecting the TTL I/O Ports to Oscilloscope using SMA cables. MAPS™ ED137 Radio and Telephone Emulators - GL's MAPS™ ED137 Radio and MAPS™ ED137 Telephone emulators can simulate Radio and Telephone calls as per EUROCAE's ED137-1B and ED137-2B specifications. Using Bulk Call capability of these tools user can generate hundreds of calls as background traffic while making delay measurements. Good sample applications can be to simulate real time scenarios like PBH and PBM by generating required bulk calls in the background. IPNetSim™ – GL's IPNetSim™ an IP Network Emulator connects to the 2 end points of a WAN link, allowing it to be configured to act either as a transparent bidirectional Ethernet link or a simple Ethernet bridge between 2 end points. It emulates a 10 Gbps or a 10/100/1000 Mbps full duplex link. . The incoming traffic can be identified into separate user defined stream for each direction, which can then be modified to simulate network malfunctions. Each direction supports up to 16 streams, allowing up to a total of 32 streams in both directions.